Written on the inside ; V. ZAREMBA (also the neckornament carries this signature), most likely she was the owner of the dance hat. She was a niece of the famous legong dancer Ni POLLOK. Made of wood, buffalo-leather, mirrors and bamboo. 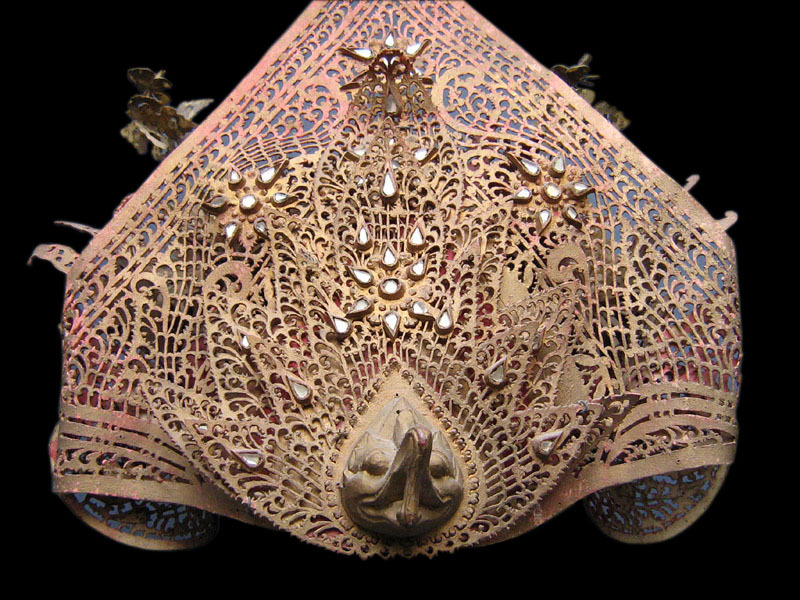 It must have been a painstaking work to cut all the beautiful ornaments into the leather. Only the best dancers were given this quality of hats. Rare object because on Bali usually the older hats are re-used by painting them over or fixing new material onto them. This hat is still in the original form in which it was made as is the original neckornament. Looking at the seize of the neck it is clear that the user was not older than 10-12 years. In pre war Bali only very young girls were allowed to perform the difficult legong dance. Pls click on each photo to see two larger images.